Hearty Vegetable-Bread Casserole - Easy preparation: The oven does most of the work! 1 Peel the onion and dice finely. Peel the carrots and also dice. 2 Clean the fennel, quarter and cut into small dice. 3 Heat the oil in a pot and cook the onion over medium heat until translucent. Add the carrots and fennel and sauté until softened, about 5 minutes. 4 Stir in the tomato paste and cook briefly. Pour in 200 ml (approximately 3/4 cup) of water and season with salt and pepper. Cover and cook over low heat for about 5 minutes. 5 Meanwhile, cut the bread into 1 cm (approximately 1/2-inch) thick slices and remove the crusts. 6 Cut the cheese into thin slices. 7 Heat the milk in a large pot until lukewarm. Remove from heat and dip the bread slices into the milk to coat completely. Brush a baking dish with the butter. 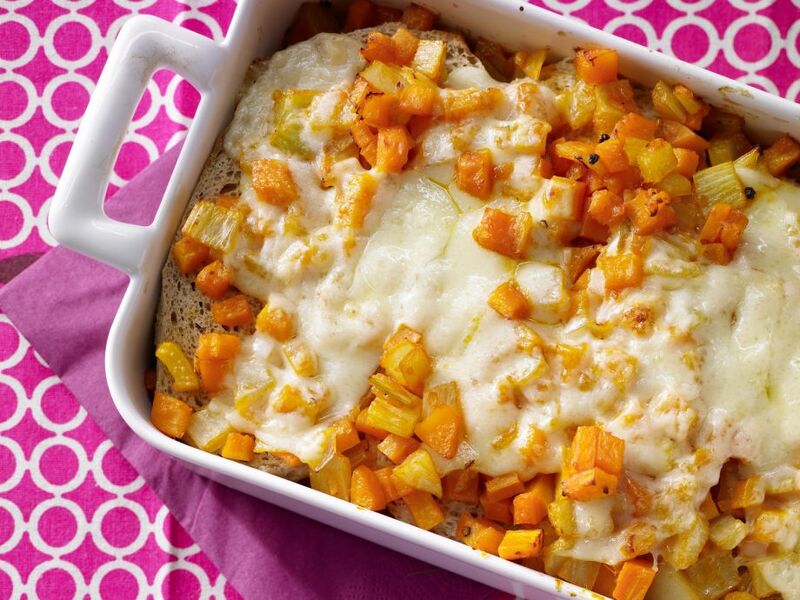 8 Fill the dish with alternating layers of bread, vegetables and cheese, ending with cheese. Bake on middle rack of preheated oven at 180°C (fan 160°C, gas mark 2-3) (approximately 350°F/convection 325°F) until bubbling and golden brown, about 20 minutes. Let cool slightly before serving.